Here’s another way to find new ways to play with your poetry and make it even more intriguing and fun than it is now. Tip #11 – Change Perspective in Your Poem to Spark New Ideas Some poets write only in the first person because "this is how I always write." The same is true of poets who write in third person or write as an omniscient voice, seeing and knowing all and then narrating for the reader. OctPoWriMo provides an opportunity for us to grow as poets. Check out how I switched it up with my poem below. It was originally written as a “Dead Woman” poem, following the form popularized by Marvin Bell in his Dead Man Poetry. She sits at the keyboard, wondering what the next thing to accomplish will be. Should it be the poem that brings silent awe at the final word? Should it be the haiku or the cinquain or should it be the script? She looks at the candle, flickering, meant to provide ambient aroma and light. She attempts to not be annoyed by self made clichés. She would swear her fingers were pushing the keys. She knows this is not possible when the body has no weight. She edits her fifth line, deletes a word that doesn’t work. She thinks it is herself who doesn’t work anymore. She attempts to tune out the BBC, humming relentlessly behind her. she has despised for the last twenty-two years. She was never successful at completely tuning out her annoyances. She steps through the blue wall that marries the river rock to the outside world. She leaves the poem and her candle behind which the haunting man doesn’t notice. How would this be different if the main character was “The Dead Woman” rather than “She”? I realized in the rewriting it is more haunting and creepy this way. There are hints the main voice is not alive, not still human, but when she walks through the wall… to me that is where everything shifts. Ironic, without The Dead Woman how a living, haunted man changes for me, too. The other way I play with changing perspective is to change first person, confessional style poems into the third person. I find when I change them to “not about me” suddenly a different energy takes over and usually makes the poem more true, more rich, more meaningful. The poet in me knows I can change names, change genders, change whatever I want to in order to make my creativity flow… just like you can. Let me know how your new poems turn out, and what those new poems spark for other new poems. 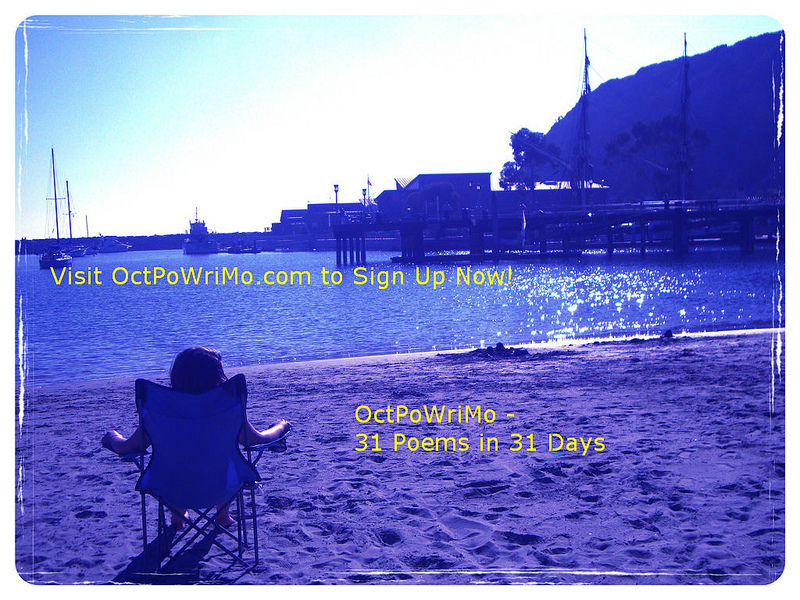 Be sure to register for OctPoWriMo if you haven't yet. Here's a link for you to sign up now.